NOT Just for Overweight or Obese Kids! 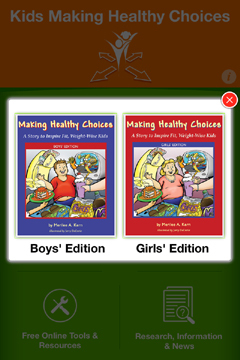 This App contains a first-of-its-kind book where important health themes “served up” in an easy-to-read style intended to help overweight kids get on a healthy track, as well as motivate those within a healthy weight range to not only continue making wise lifestyle choices, but also better understand and empathize with peers currently struggling with a weight problem. 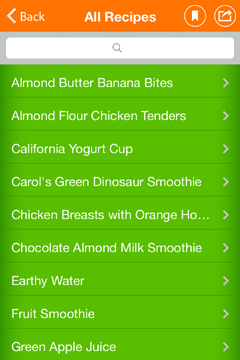 iPhone® and iPad® APP - just $2.99! "It's a thrilling book...a great way to inspire a child and educate the child at a very early age...love it!" best thing I think you can do for your kids..."
"[This book] is easily relatable and is a good tool for parents to help their children learn about the benefits of healthy habits." 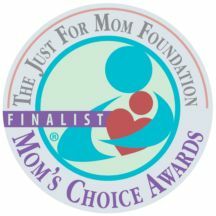 This award-winning, ground-breaking fictional children’s book depicts the life of an average overweight American kid as (s)he encounters the emotional and physical challenges associated with an adolescent overweight condition. 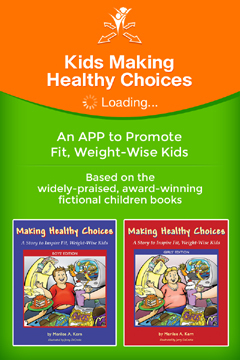 This books uniqueness, however, lies with its mission to not only help children recognize the overwhelming amount of cultural influences that adversely impact their ability to make good lifestyle choices, but also lessen the emotional burden of self-blame carried by those who have internalized sole responsibility for having become overweight or obese. Releasing this burden enables these kids to re-focus their emotional and physical energy on making positive, healthful changes in their life. In the end, this is a book of hope that spotlights a representative overweight child who, by better understanding society's many pressures and influences as well as the importance of living healthfully, achieved his/her goal of living a happier, more fulfilling life. 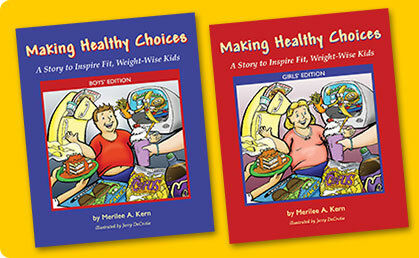 Revgear Sports Integrates Obesity-Related Fictional Children's Book Into its Wholesale Kids' Health "Empowerment Package"
Click here to read a summary of the Institute of Medicine's report on "Food Marketing and the Diets of Children and Youth"
Click here to read findings from a study published in the JAMA citing "poor fitness common in teens"
Just Who Is Merilee Kern? Copyright © 2005-2014 Upward Bound, Inc. All Rights Reserved. "We know how important it is for young children to learn to make the right decisions about food and exercise. Your books are a very valuable resource that a parent or teacher can share with a child." "It's is about time that someone wrote a book for kids about obesity in a positive format. I am ordering a few today. I plan to work with a local pediatritian in solo practice to help his obese patients, and this is the ticket." "I love this book! 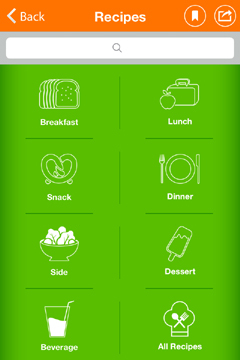 I think it's a tool that will be very helpful for kids who need motivation and education to help them lose weight!" Grandma's Healthy Kids Club, Inc.
"What a wonderful job you have done, I truly appreciate the work you have put into the study and your book." "Fitwize 4 Kids' fundamental mission is to enhance our kids' collective understanding of how to make wise lifestyle choices, and to instill the motivation and desire to get - and stay - on a healthy track throughout their lifetime. 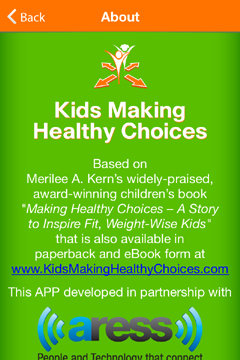 Ms. Kern's new children's book is a fantastic tool in working toward this end, and we're extremely pleased to partner with her to champion the health of our nation's youth." "It’s great to have a book that illustrates the problems with weight gain – and then a simple solution to one of the components (activity)." "I recently purchased the PDF of the coloring and activity book for children and really enjoyed it..."
- Sarah Kushner, MS, RD, LDN North Shore Pediatric Therapy, Inc.
"I read it and enjoyed it...Thank you for your important work." "We’re brand-new, and we just wanted to let you know that we’re big fans of yours. 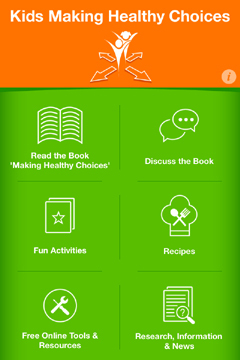 We featured you[r book] on our blog recently"
"I'm excited to tell others about the new APP based on your book. It's a fun and unique way to reach kids. What a great way to get kids to stay on a healthy track!." Find Information On Which MBA Program is best for you.